GBA Shining Soul (USA) in 49:46.88 by DarkKobold. Shining Soul is an Action RPG by Atlus. It is the first 'Shining' game to not be produced by Camelot Software Planning, and thus is not considered canon in the 'Shining' universe. 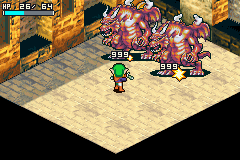 However, the game serves as an internal homage to much of the 'Shining' series. All of the bosses are major villains from a previous 'Shining' game. The author manipulates randomly-placed monuments to appear, increasing attack power as much as eight-fold during the run. Additionally, hundreds of critical attacks had to be painstakingly manipulated to allow for enemies to die in a single hit.